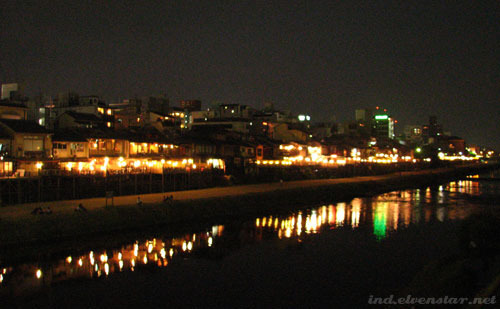 This is the Kamogawa, the river that runs through Kyoto. 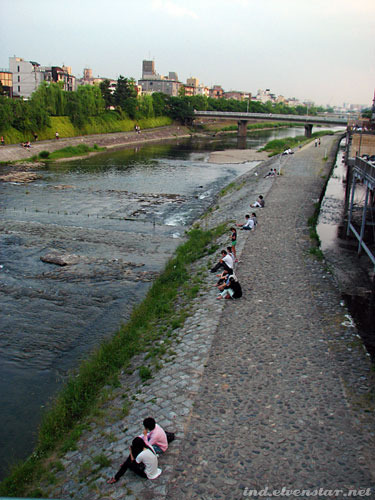 There were quite a few people sitting around on the banks, enjoying the evening air. According to Yang and Danny, on the weekend there were far more people than that, and even some buskers. 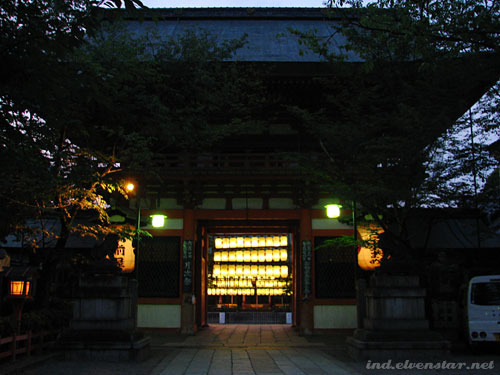 You can randomly find small shrines or temples around Kyoto. 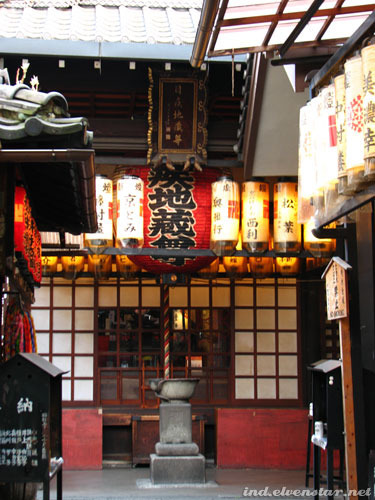 We came across this one somewhere in Gion, around Shijo Dori*. 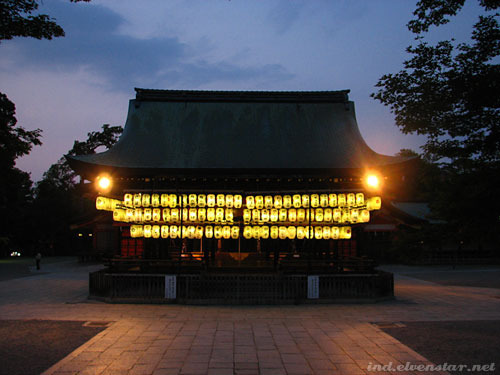 Chugenji Temple, is what it was called. 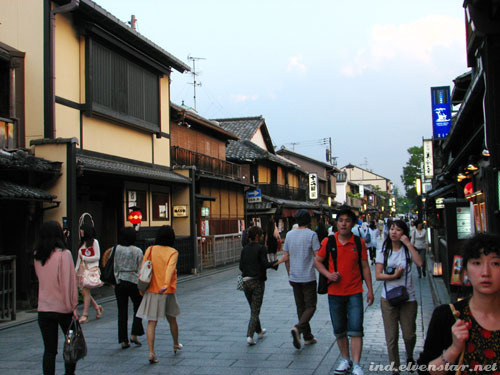 * The “dori” indicates street/road/avenue. 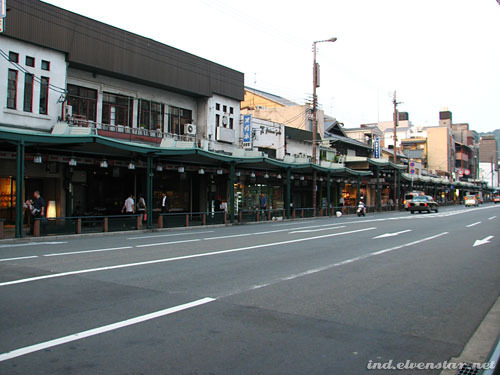 So, Shijo Dori (or Shijo-dori; I don’t really know which is a better way to romanise it) means Shijo Street or Shijo Avenue. I didn’t note the road name when we were there, but judging by the position of Chugenji Temple on Google Maps, this was on Yamato Oji Dori. 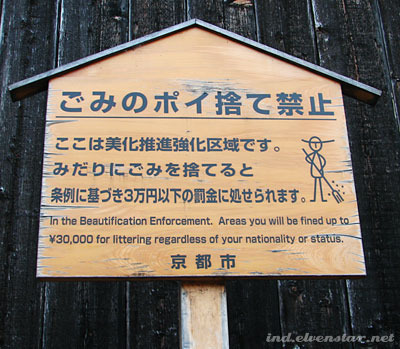 “Beautification Enforcement.” haha And they just had to have a rather appealing little stick figure there sweeping the floor. Still somewhere down the same street. I found that triangular weight hanging below the lantern interesting. 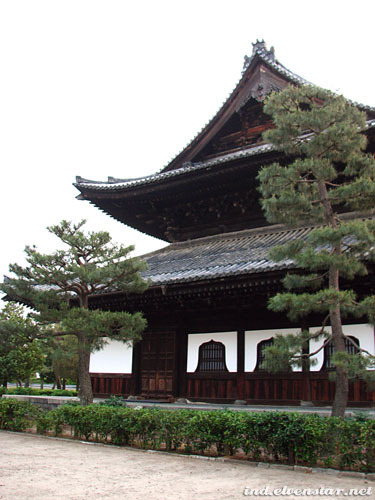 Stumbled upon Kenninji Temple. We were literally just almost aimlessly wandering down the street and came across it. 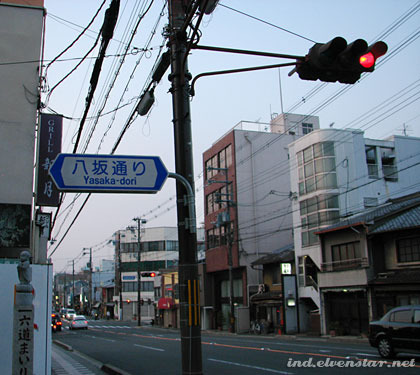 A signboard indicating Yasaka Dori along the main road Higashi Oji Dori. 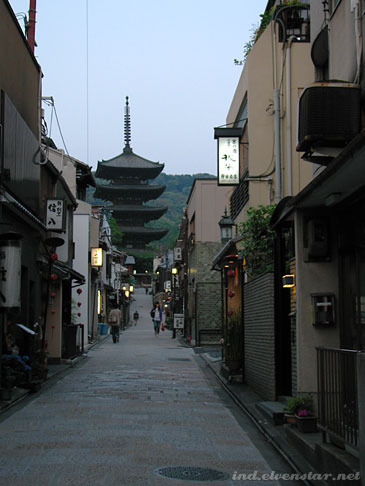 Approaching Yasaka Pagoda. I put up a brighter, more saturated-colour picture of this earlier here (a pic that was taken with my iPhone). 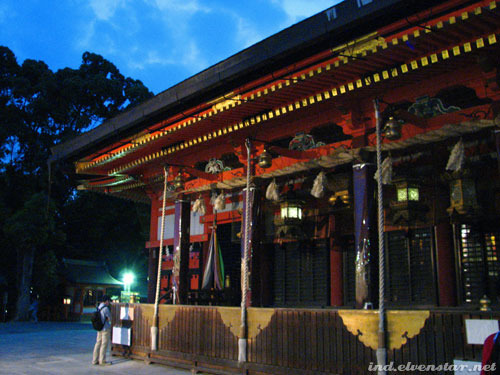 We walked on (took a left at the Yasaka Pagoda) and eventually arrived at Yasaka-jinja‘s side gate as night fell. 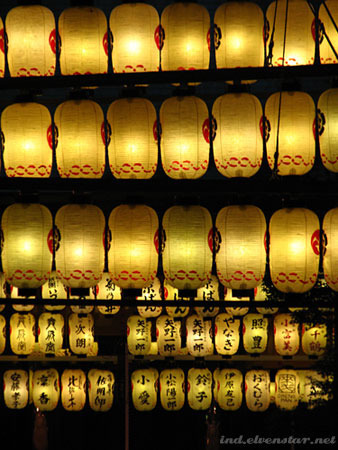 *stares at lanterns* Well, the second from the left reads “Pachinko F-1”. lol The first on the right reads Rumapuraza Sauna. Ruma Plaza Sauna? 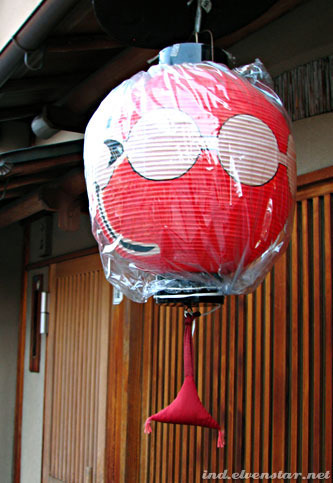 I wonder if the lanterns are sponsored by certain people/companies. That would explain the different labels. 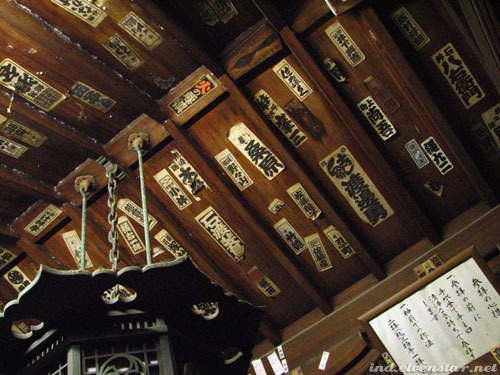 The main hall, with three large and long ropes attached to bells. You’re supposed to clap, ring the bell, pray silently and then clap again or something like that. I’m not sure of the exact procedures. 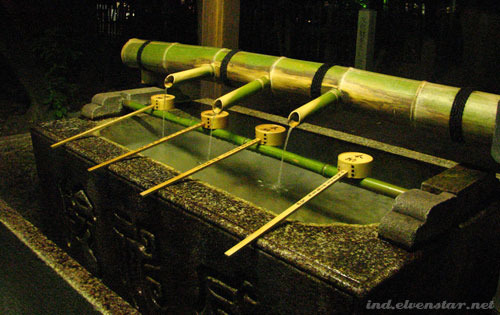 The chouzuya at the main entrance, where you’re supposed to take the water to purify yourself before going into the temple. 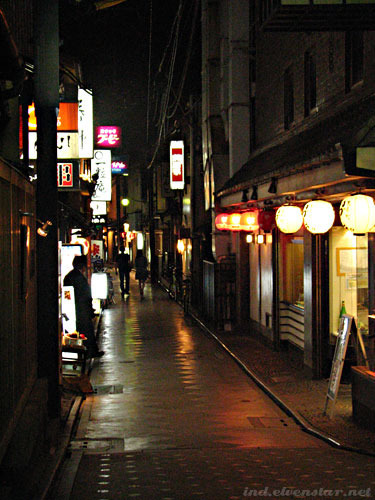 Back on Shijo Dori. 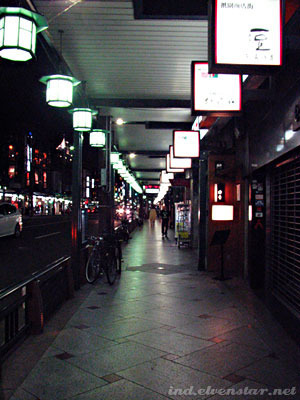 Note the very neat and tidy arrangement of the cylindrical lamps and the little square signboards. 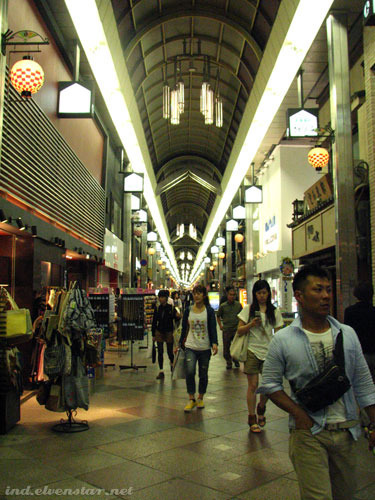 Teramachi Dori, a shopping street where we had dinner. 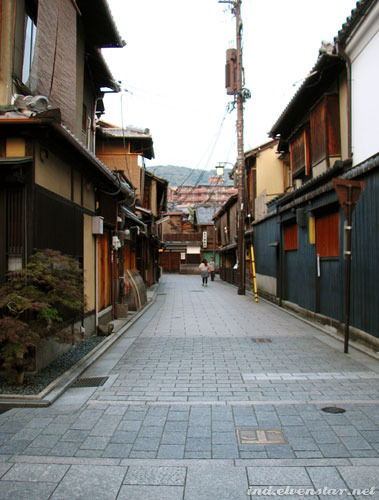 the second last photo is potoncho near kamogawa, i think.